Kangaeroo.com is usually concerned about kangaroos, especially those in Japan, but now it’s Tiger Time! 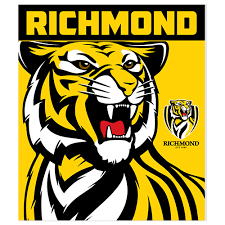 Richmond Football Club, the Tigers, are one of 18 teams competing in the Australian Football League. Football in Australia can mean many different sports, mainly depending on the location where the word is used, but the most Australian variation refers to Australian Rules Football, an indigenous sport with professionals found only in Australia (the game is played by amateurs in dozens of countries all over the world, including Japan). Richmond was once the most feared football team in Australia. From the late 1960s to the early 1980s, the Tigers played off in the VFL Grand Final, the most important game in the league and the match to determine that year’s champion team, on six occasions, winning four times. 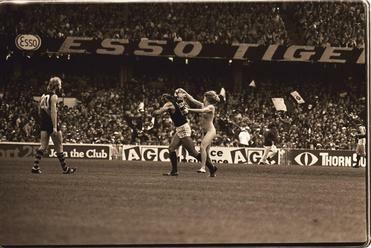 When Richmond made the 1982 Grand Final, it entered the match as a hot favorite and was leading until just after half time. At that time, a young female stripper ran onto the ground. The Tigers never led all other teams in the league again. Move ahead 35 years, almost to the day. On September 23, 2017, the Tigers will take on the Greater Western Sydney Giants in a Preliminary Final with the winner to progress to the 2017 Grand Final against the Adelaide Crows to become the champion of Australia. Richmond would be unlikely to win that game, having a pretty ordinary record against the Crows, which has been the best team in the league throughout this year. Nonetheless, Australia, particularly the Aussie Rules heartland of Melbourne, is in the grip of Tiger fever. A crowd exceeding 90,000 is expected to watch the Tigers take on the Giants, whose fans have purchased just 1,200 tickets to watch the game.